Nikhil Alva, 38, CEO of Miditech, a television production company, travelled to Ladakh for a six-day rafting expedition down the Zanskar river in August. His takeaways: a renewed faith in the self, a bunch of new friends and the decision to take on the mighty Brahmaputra, come December. Have you always been into extreme sports? I love the adrenalin rush that extreme sports gives me: I’ve been hooked on hiking, climbing and cross-country running since college. And I got into river-trips after an expedition on the Alaknanda in 1995, when my brother Niret and I made our first rafting film. 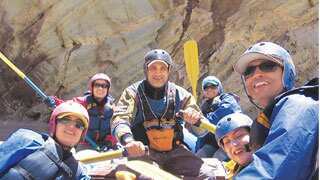 A close friend, Vaibhav Kala, is one of India’s pioneering white water rafters, so that helps as well. Did you need a special fitness regimen ahead of the trip? What about gear? No, I didn’t put myself through any special regime. My regular routine—running and cycling, push-ups, pull-ups, sit-ups and some amount of stretching—is all I need to stay reasonably fit and control my weight. You flew into Leh from Delhi; how difficult was the acclimatization? I had been to Ladakh many times earlier, filming documentaries and even driving from Manali to Leh twice, and quite enjoyed the experience. To ease myself into the thin air, I took it easy and enjoyed doing nothing for the few days we were there. That said, Leh is one of my favourite places—a great mix of history, culture, religion and quaint places to eat and shop. It’s mostly foreigners from all over the world who make Leh their base for their treks to different parts of Ladakh. Very few Indians make their way here, I guess because it doesn’t provide the usual tourist attractions. I guess the adventure really began on leaving Leh. That’s right. From Leh to Remala, the drive took three days—it was spectacular, since the road traverses through many high passes and some of the starkest landscape I’ve ever seen. Each day, we drove about 8-10 hours before camping for the night, first at Kargil and then at Rangdum. The group was in high spirits, looking forward to getting to the river. On the third day, we drove to Remala, the starting point of the river expedition. How many of you made up the group? We were about 25 people in all, including the support staff. The expedition was completely self-contained, which meant we carried everything we needed—food, tents, fuel, et cetera—on the rafts. Each day, the river guides would identify camping sites for the night and it would take three to four hours for us to haul up the rafts, unpack and pitch the tents and then take them down the next morning. The first-time excitement of setting up camp at Kargil was definitely a high point of the trip. The kitchen staff did a fabulous job conjuring up super meals in very difficult circumstances. How much time did you actually spend on the river? The trip lasted 12 days, of which six were on the river. We started on the Stod, a tributary of the Zanskar, which we rowed into on Day 2. Each day, we spent about 6 to 8 hours rafting. Physically and mentally, the trip was challenging, though it was never dangerous or life-threatening. I think I coped reasonably well, except for a couple of days when I felt nauseous and caught a stomach bug as well. How important is the company in a scenario like this? Very important—after all, if you’re going to spend two weeks with strangers, they had better be people you can relate to. Especially with something like rafting, where you have to work as a team. There are at least six people in a raft, three on either side, and each person has to pull his weight. Luckily, on this expedition, there were a number of interesting, like-minded people, and we got along very well. The weather held remarkably well. We had a bit of rain on one day; otherwise, it was blue skies throughout. The days were around 20 to 25 °C, while at night temperatures dipped to about 10°C. The water, from freshly melted glaciers, was ice-cold, though. The surrounding scenery was stark—high, craggy mountains with very little vegetation, the occasional monastery or little village perched high above us. The course has quite a few formidable rapids. How did you take them? Rapids are the tough part, calling for different rowing skills and 100% effort from everyone on the raft. We have to work in tandem, on verbal instructions only. The first rapid we encountered on Day 1 was also the moment when it all came together for me; every step till then had been a build-up to this experience. The most challenging stretch of Class IV rapids came on Day 5, between Nyerack and Lamaguru: The river squeezes itself into a gap of about 18ft, which translates into an enormous volume of turbulent, fast-moving water. A couple of years ago, we learnt, a raft had actually capsized here and the team was stranded for five days. Thankfully, we negotiated them quite easily. It was hugely exhilarating. The expedition ends at the confluence of the Zanskar with the Indus. Did you take in the significance? The confluence comes up in the last half-hour of the river journey. The Indus is such a mythologized river, but very few of us have seen it. At the confluence, the Zanskar is much bigger and more powerful than the Indus. 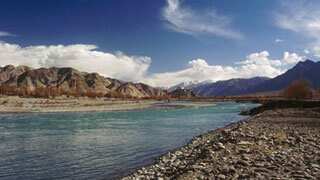 The Zanskar is brown and stormy, the Indus is pure glacier melt, bluish-green and calm. It’s a sight one treasures as much as the feeling of physical and mental well-being on account of being in a wonderful place with clean air, spectacular scenery and pushing the body to its limit. Rather uneventful. Each of us was thinking not just of what we had been through but also of the fact that the expedition was drawing to an end, and that we would soon all go our own ways. Air Deccan and Jet Airways fly from Delhi to Leh. Current return fares start at Rs2,200 for Deccan and Rs5,000 for Jet.